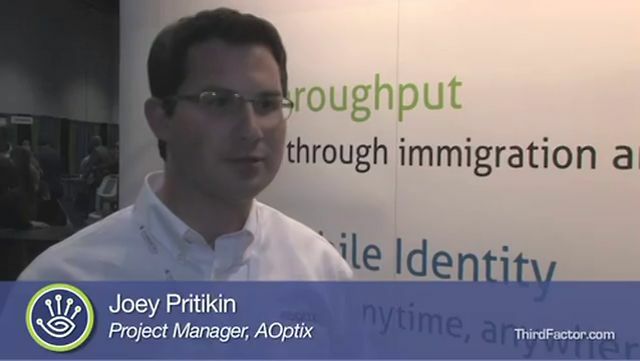 The prototype AOptix demonstrated at the Biometric Consortium Conference showcased the company’s InSight SD with a dongled camera capable of capturing an ISO-standard face biometric at the same time as capturing the iris when standing at the two-meter distance from the device, says Joey Pritikin, product manager for AOptix Technologies. The company worked with Aware to integrate the AOptix iris capture system with Aware’s face capture and universal registration client. “By leveraging the way that the InSight works and the tools that Aware brought, we were able to put the two modalities together in a very quick process that has really resulted in something that is a prototype but it works quite well,” added Pritikin.